Suuure looks like you're sitting somewhere specific. And modeling leggings while there. Which really is the only place that would make sense. 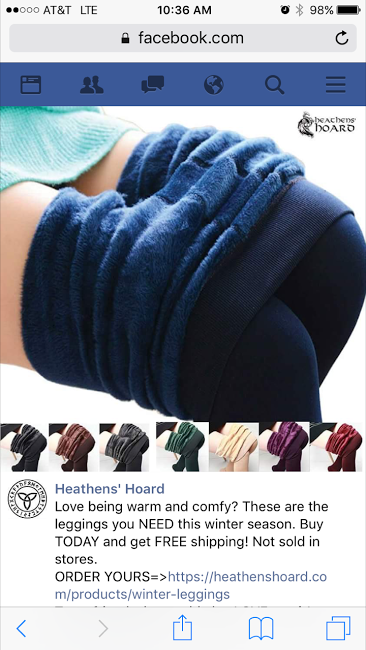 How else would you make an ad for fleece-lined leggings appear natural? You can't just turn them inside out. And nobody will take your word for it if you just show us the outside and merely tell us they're fleece-lined. So, clearly this was the only way to do it. And I am pleased. And I thank you. This disturbs me. This pose should never be used in advertising anything ever. But I do want some fleece-lined leggings. Me too. Maybe this is a good ad after all. Look how comfy she is sitting on the toilet.